For 1980, Lincoln completely revised the Continental Mark series, downsizing it for the first time and adding a sedan. The coupe was over 14 inches shorter than the 1979 Mark V and about 750 pounds lighter. However, the Mark VI was still a big car by any standard—a foot and a half longer than a 2019 Mercedes-Benz S 560 coupe. Standard power for 1980 was a Windsor 129 bhp 4.9 liter/302 ci V8 with throttle-body fuel injection paired with a four-speed automatic overdrive transmission. Buyers could specify a $160 upgrade to the Windsor 140 bhp 5.8 liter/351 ci V8 with a Motorcraft 7200 VV two-barrel carburetor. With the standard powertrain, 0-60 took about 14 seconds in the 3,892-pound car. Mileage was 17 city/24 highway by the standards of the day—with the 18-gallon gas tank, Mark VI owners could expect a range of about 330 miles with a 10% fuel reserve. Standard exterior and mechanical equipment on the $16,291 base Mark VI ($54,600 in today’s dollars or a little over what a 2019 Lincoln Continental Select costs) included hidden halogen headlamps, luxury wheel covers, and P205/75R15 white sidewall tires (a size still readily available) on 15-inch wheels. Inside, cloth Twin Comfort lounge seats, power windows, an electronic instrumental panel with message center, a four-spoke color-keyed steering wheel, automatic temperature control air conditioning, and an AM/FM stereo radio with power antenna were all standard. As had been true for many years, there were multiple designer packages available for the Mark VI: Bill Blass ($1,825), Cartier ($2,191), Emilio Pucci ($2,191), and Givenchy ($1,739). There was also the Signature Series ($5,485), which added just about every possible option and brought the price to $21,776 (about $73,000 in 2018 dollars). Individual options included touring lamps ($67), Twin Comfort six-way power seats ($171), a tilt steering wheel ($83), and automatic speed control ($149). Continental Mark VI page from the 1980 Lincoln brochure, linked from the Old Car Manual Project’s amazing brochures pages. 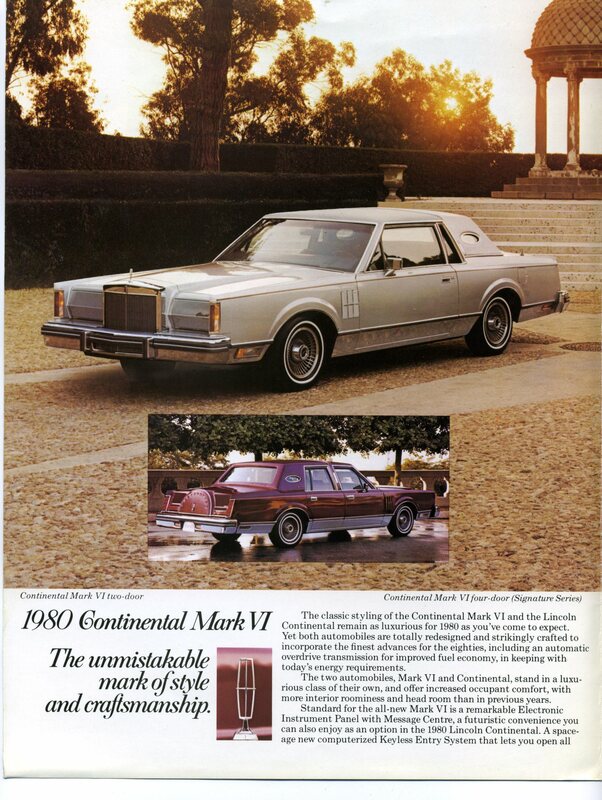 Like the Ford Thunderbird of the same year, the 1980 Continental Mark VI did not sell. Sales of the coupe dropped to 27% of the 1979 number—even if you added the newly-available sedan, they were still down 49%; not a good look for a brand new model. To make the news worse, the virtually unchanged Cadillac Eldorado (which had been downsized on 1979) more than doubled the Mark VI coupe’s sales. The agony would continue for several years, only changing with the release of the aerodynamic and significantly smaller Mark VII in 1984. According to Hagerty’s valuation tools, all the money for a 1980 Continental Mark VI in #1/Concours condition is $15,200, with a far more typical #3/Good car going for $6,300. Values slide up with the various designer packages and the Signature Series, but only by about 5% to 10%. This generation of Marks maintains some presence in the Hemming’s Motor News classifieds and on eBay Motors—as I write this in July 2018, there’s burgundy 1980 Signature Series coupe with 4,800 miles for sale asking $25,000.